Pocoyo Christmas Screensaver is a useful screensaver that has as a main character the famous children animation character, Pocoyo. With this utility the appearance of your computer will meet your kids' expectation when you aren't working with it. Created in Spain, but first launched in Britain, Pocoyo is normally always accompanied by: Pato and Elly. This series has become one of the most important kids series all over the world, having been screened in many countries. The animation shows the creation of a tapestry on the screen with the main character from the series. The wool will start to appear from the top of the screen giving the tapestry shape until the moment in which you will be able to see the full tapestry. 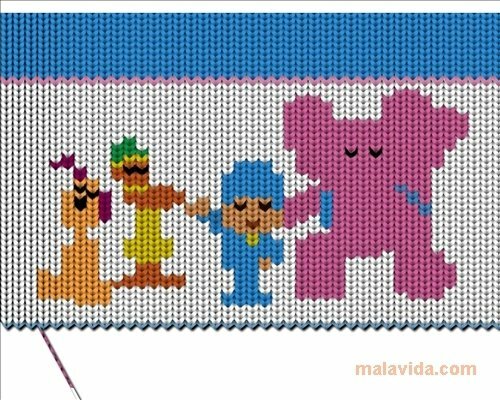 Pocoyo and his friends are here! The screensaver allows several configurations, like the possibility to eliminate the sound that plays in the background, or the possibility to change the resolution depending on the desktop that you use. 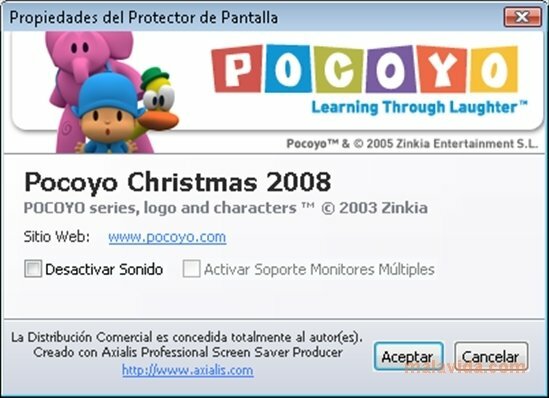 As well as this, Pocoyo Christmas Screensaver allows you to place a desktop icon so as to launch the screensaver whenever you want. Put Pocoyo on your desktop this Christmas with Pocoyo Christmas Screensaver. - This download requires a ZIP compatible compressor. - The trial has certain limitations.